Microsoft 2018- Microsoft has not had a tremendous quarter. But it has still succeeded in regaining a coveted title: most valuable public U.S. company by market cap. And even though Microsoft’s product announcements still might not rivet the public like Apple‘s keynotes, the company has moved forward in measurable ways in 2018, following years of transitionunder CEO Satya Nadella. 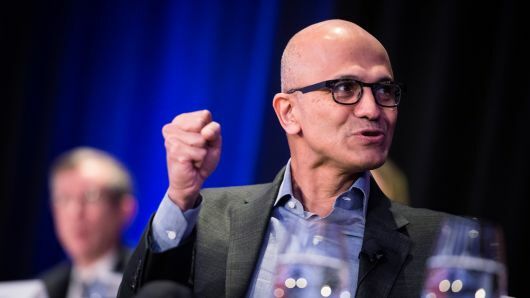 Nadella’s Microsoft, which has prioritized things like the cloud, open-source software and cross-platform services and has de-emphasized Windows, was arguably synthesized in a remark he offered in an interview with CNET. “You join here not to be cool, but to make others cool,” he said. It’s now been one month since Microsoft captured the most-valuable-public-company title from Apple. This is the first time Microsoft is ending the year as the world’s highest valued public company since 2002. The fourth quarter hasn’t been the best quarter in history for the company. (That was the first quarter of 1987, when the stock price doubled.) In fact, this was one of its poorer quarters through the years. The stock was caught up in a wider market selloff, and it declined by 11 percent this quarter. And yet, Microsoft was discounted less than other top companies. Amazon fell 25 percent in the fourth quarter, and Apple went down 30 percent. For all of 2018, shares of Microsoft rose almost 19 percent. It stands out as one of the top five components of the Dow Jones Industrial Average for the year. At the end of 2018, Microsoft’s market cap stood at $779.7 billion as the stock closed at $101.57 per share. Microsoft has had a strong year. It continued its streak of exceeding analysts’ estimates for earnings and revenue with each of its earnings reports. Its June GitHub acquisition, the third most expensive in the company’s 43-year history, behind LinkedIn and Skype, has been well received. The post Microsoft closes out 2018 as the top public company appeared first on erpinnews.